Innocent IV studied Law at Bologna University, was pope from 1243 to 1254, and was still revising the present work until he died. It is a commentary on one of the most important medieval collections of Canon Law, drawn up at the order of his predecessor, Gregory IX. The style of script and decoration show that this manuscript was written and illuminated in Italy (probably Bologna), but an inscription on the first page states that the book belonged in the abbot's study, and a similar inscription in another British Library manuscript (Royal MS. 8 G.i) suggests that this refers to the abbot of St. Albans. 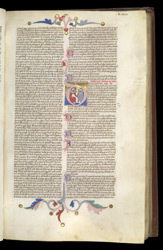 In this initial 'D' the seated figure is an ecclesiastical judge--perhaps the pope himself--and the two ecclesiastics before him are archbishops, as shown by the Y-shaped pallium they each wear. The faint inscriptions in the right margin are guide to the rubricator and a pecia note.